Can a system of this type improve the spatial cognition of its users? Can a system of this type improve the mechanical reasoning ability of its users? Can a system of this type introduce children to a subset of practices found in engineering disciplines in a manner representative of the way that engineers work? By providing young users with sophisticated design software and by coupling that software with computer controlled machine tools such as carbon dioxide laser cutters, we hope to not only obtain answers to these questions, but also to provide users with engaging, educational, and entertaining activities. Adult CAD/CAM tools, like much of the software created with adult users in mind, often have complex interfaces and are difficult to learn. In the design and implementation of MachineShop we have taken two major steps to make it accessible to young users. First, we have chosen a single domain for which the software will be used; mechanical automata. Second, we have defined a rich but constrained subset of components and operations that can be combined to create a wide variety of automata. This reduces the difficulty of learning to use the software and provides support while users are exploring and learning about the domain. A sea lion built from wood and craft foam. When the crank is turned her tail and flippers move and she spins the ball on her nose. With the exception of the ball, the wooden parts were cut with a carbon dioxide laser. Immensely popular in the 18th and 19th centuries, automata are quietly making a comeback. Automata (from the Greek automatos meaning "self moving") are machines which imitate the actions of living creatures. They do this through sometimes complex mechanisms which control the motions that they perform. 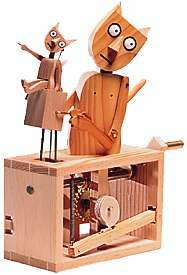 The earliest accounts and drawings of automata are over two thousand years old. Hero of Alexandria includes the earliest descriptions of automata in his work The Pneumatics. While it is unclear if any of the automata he describes were ever built, it is obvious that all of the steam powered devices included would have worked. In his examples the motion is simple while the depictions of people and animals is true to the classic Greek art forms of his time. The art of automata reappeared during the European Renaissance and was most often found in the mechanical figures of the great public clocks of large cities. This marked a change in the mechanics which produced the movements of the figures. In Hero's time steam was the cutting edge technology and it provided the basis for his body of work. In the 14th and 15th centuries the most advanced mechanical process was the clockwork movement and it is no surprise that it was used to great effect in automating the moment of figures. 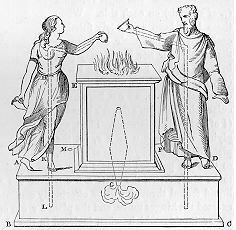 Libations on an Altar produced by Fire from The Pneumatics. Steam produced by the fire is forced up the tubes in the figures. This causes the goblets they hold to tip and pour wine onto the fire. In the 18th century as the crude clock movements gave way to the delicate craft of the watchmaker it was only a matter of time before the movements which powered automata would take advantage of the smaller size and subtlety this new technology provided. 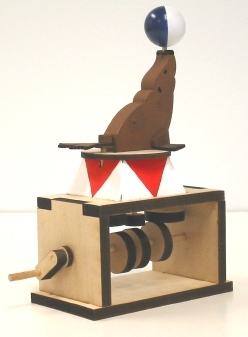 At the same time, many watchmakers found their skills could be showcased by the construction of automata. To advertise their abilities some, such as Jaquet-Droz and Jacques de Vaucanson, created truly beautiful works of art that so closely imitated real people and animals that their fame has endured to the present. This was truly the golden age of automata building and it led to a booming market in simpler, less expensive clockwork toys and novelties, many designed for children. These are among the first such items ever created specifically for children and this was the start of what we know as the role of toys in children's lives. Three automata by Pierre Jaquet-Droz and his son Henri-Louis. From left to right The Draftsman, The Musician, and The Writer. Preserved in Switzerland, these automata are capable of intricate behavior and mimic the movements of human beings with uncanny precision. World War I saw the end of the popularity automata had enjoyed. New technologies such as the internal combustion engine and electricity replaced clockwork for many of the tasks it had done so well. Many of the beautiful automata of the previous century succumbed to neglect, loss, and destruction. Some, such as the three creations of Jaquet-Droz found their way into museums where they still fascinate. But for most people the sight and experience of automata became another piece of history, removed from their actual experience. But the craft never really died out and automata enjoyed a resurgence in the 1970s and 1980s that is still going strong. While many builders, particularly in Europe, have been creating for quite some time, the efforts of Sue Jackson at Cabaret Mechanical Theatre in England brought together some of the most respected artists in the United Kingdom. In addition to providing a venue for the public to once again be amazed by these creations, Sue has spent twenty years making the machines and the techniques of their design and construction accessible to school children. This new interest in automata is in part due to new ways of thinking about the objects as art. Historically, automata were created to inspire reverence or awe at the beauty and grace of the figures. To aid in these reactions, the mechanisms responsible for the movement of the figures was usually hidden from sight and viewers were left to speculate about how such events could be taking place. Today, however, a large number of artists see the mechanism as integral to the overall effect being sought which, as often as not, is whimsical or amusing. Having the cams, gears, and levers of the mechanism in plain sight can make the motion that much more intriguing since not only the motion is visible, but so is the source of the motion. The Barecats by Paul Spooner. Icon of Cabaret Mechanical Theatre. When the user turns the crank, the big cat turns the little cat's crank. The little cat points to the user. The question becomes "who is cranking who"? This recent perspective on automata helps make them a good domain for exploring how children think spatially, how they learn to reason about machines, and how they design 3-dimensional physical objects. These are the things that MachineShop is intended to explore and support. MachineShop is not an adult tool that has been "dumbed down". It has instead been designed from the ground up for younger users by filtering out features that have little relevance to the domain and focusing on making the important features easy to understand and work with. 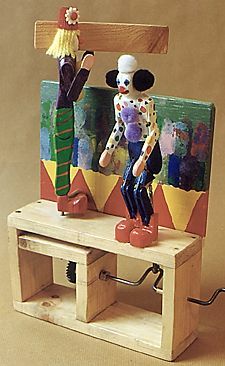 By restricting the domain to the kinds of simple mechanisms that can be found in contemporary automata, users can create a wide variety of interesting and captivating works of art. The MachineShop software consists of four sets of tools; component editors, library browsers, mechanism sketching, and movement exploration. Each of these will be described in more detail below, but it is important to remember that all of the tools are designed to work together to help the user create what she has in mind. The process of design is composed of four basic tasks; developing the initial concept, designing the component pieces, fabricating the components, and fitting and assembling the components. MachineShop aids users during each of these tasks. The first thing a designer must do is decide what to create. Often this is a difficult task for novices who lack the kinds of domain knowledge that experts have. In MachineShop, the Movement Explorer tool provides the kind of information a novice will find useful in learning what kinds of mechanisms can convert a specified input motion into a similarly specified output motion. The tool provides text descriptions of candidate mechanisms and lets the user view a short movie of the mechanism in action. Once the user has found a mechanism that she wants to add to her design she can move to the sketch tool and do just that. In this 3-dimensional work environment she can add, move, position, and remove components and sub-assemblies to quickly visualize her design. This tool is intended to represent the completed mechanism in the same way a pencil and paper sketch would; a visual catalog of what each piece is, where in the mechanism it exists, ahd how it relates to all of the other pieces. With sketch in hand the user can now proceed to creating each of the components that will make up her mechanism. 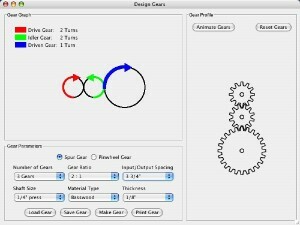 Cams, levers, and gears are all currently supported and the system is designed so that new kinds of components can be added. Learning about how crank sliders convert rotary motion into elliptical motion. Each family of component has it's own environment in which it is created. These editors provide the user with control over many parameters of the component's design including the choices of materials in which it can be fabricated. Each editor panel is composed of three sections. In the upper left is a graphical representation of the important aspects of the motion produced. 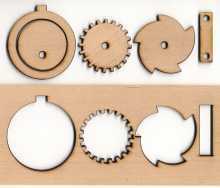 In the case of the gears shown above, the black circles represent the relative sizes of the gears. The arrows indicate the direction of rotation. The length of each arrow indicates the relative distance each will turn and an arrow's thickness indicates the relative force applied or torque produced. The lower left panel contains the controls to set and adjust component parameters. In addition this panel contains controls to save and load components to and from the component library, to send the outline of this component to a printer, and to create a file that can be used to fabricate the component on a computer controlled machine tool such as a laser cutter. The right hand panel shows the profile of the component that the user has created and allows her to animate the component to observe how it will look in the finished mechanism. Once happy with what she has designed, she can save it to the library, print it to paper, or create a fabrication file from which the part will be made. Creating a train of 3 spur gears with a drive to driven ratio of 2:1. MachineShop is capable of creating fabrication files for many types of computer controlled machine tools. Currently it's used with a carbon dioxide laser cutter which can cut pieces from flat strips of materials like wood, plastic, cardboard, and fabric. This process is analogous to the way an inkjet printer or plotter works, but instead of laying donwn ink on paper, the cutter removes material from the work material by etching or cutting. The material is held stationary while a series of mirrors and lenses moves to focus the laser beam which vaporizes the material underneath it, leaving a very smooth cut. The beam is precisely controlled and accurate to 0.001 inches. Modern laser cutters are designed with safety in mind and are fully enclosed and interlocked so that the beam has no chance of coming in contact with anything but the material it is supposed to cut. An example of the pieces that can be created in MachineShop and cut with the laser cutter. You can clearly see how the pieces are cut from the sheet of material by the laser beam. Notice the charring of the edges from the beam. Note: this research has been concluded and volunteers are no longer being recruited. Users must be between the ages of 10 and 15. 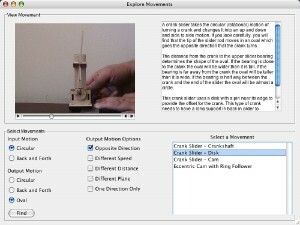 Users should be familiar with using computers (things like selecting menu items with the mouse) and should enjoy making and building things. Users must be able to come to the Discovery Learning Center on the CU Boulder campus once a week for at least 12 weeks during the testing period which ends the first week of June 2005. Each testing session will last from 1 to 2 hours. This study is monitored and approved by the Human Research Committee at CU. To participate, users and their parents must both sign release forms approved by the HRC. There are openings for 8 students to participate in this study and both girls and boys are encouraged to apply. Participants will be able to keep the automata they create when the study ends and there are options for continued followup work if participants would like to continue. This study is being conducted by Glenn Blauvelt, a PhD student in the Department of Computer Science and is being supervised by Professor Michael Eisenberg.